So a lot of people in the sort of ''kawaii'' blogging sphere (really don't know what to call it) love singer Kyary Pamyu Pamyu. If you don't know who she is then have you been living under a rock? Anyway not only are her cute tunes incredibly catchy but she also has an AMAZING wardrobe, probably styled by a stylist (or not feel free to correct me) but anyway I love everything (well almost everything) she wears and thought I'd share some of them for inspiration. There are a lot of outfits here so it's a little bit of a long post. So first this is pretty basic but it's nice and obviously Kyary Looks amazing in it. I'm really in love with this outfit, it's quite basic but the spots of the shoes work the with stripes of the skirt and just aragh I love it and I want all these clothes! All clothes here are similar. And because the blazer I found was plain I found a tutorial on studding it if you wanted to do that. I think it's actually spotty but I'm sure you can find small round studs to use. I love this dress it's all flowy and stuff and again the stripes with the spots work well. 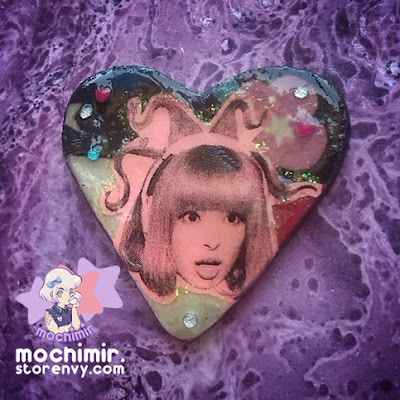 I also always love Kyary's hair I don't know how they get it so smooth and perfect all the time because mine's always all over the place. I'm not going to try and find similars for this but I had to add this as I love it. A lot of the outfits I've posted have been all black and white and i guesss this is no different apart from the shoes (super shiiiny). I absolutely love the puff sleves on her top and thought I'm not usually a fan of low crotch trousers but these are so cute, maybe that's because they're on Kyary I don't know.. This outfit is pretty basic I suppose but still goes together well. I especially lover her hair in this outfit it fades perfectly, probably a wig but still. Everything is similar again. A few of you maybe thinking "that's more like Kyary" which it probably is, this is a lot more like her stage wear and probably what she's most famous for, so in that sense it's the Kyary that most of the world see. I'm blabbing here I'm sorry. I won't bother trying to find similar items to this because I'm sure most of this outfit is handmade, it's pretty cool though. Except I found very similar leggings so I'll add them. Ok I chose this outfit for three main reasons. One because it's colourful and I seem to have a lot of black and white here. Two because it's a gorgeous outfit and three, her hair. I have seen this style around a few times now and I have no idea what it's called and so haven't been able to find a tutorial on how to do it (plus my hair is way too short) so if anyone could lead me in that direction then I would be ever so grateful. Again everything is similar items, I wish I knew exactly where Kyary got her outfits. The more I look at this outfit the more in love I become honestly. This is also really cute and similar style to the last picture, these are both pictures of the sort of style I'd love to try and I tend to find most items similar to these on taobao, hopefully I'll pluck up the courage to order something from there soon and be able to look as cute as Kyary. With the shirt I added here you can always sew spotty fabric(or other) onto the collar and cuffs. And black to black and white outfits, i really love tulle skirts ansd need to get myself one really..
Also Kyary manages to pull off a top hat and still look elegant and girly, how? not much else to say, really cute. Ok so this blogpost is making it seem like I'm like obsessed, I just love her music and style ok? She's uber cute and crazy too I mean you can't help but love her (and I'm sure people care to disagree but w/e). Oh and this next bit is purely coincidental I promise. I've recently become part of Mochimir's referral program and it just so happens that they do Kyary badges, spooky. This is one bage and they also have another. And as part of the referral (as you can see in the side bar) you can get 10% off with the code "YOUSOKAWAII" so be sure to use it and check out the shop! Thank you for reading guys, hope this gave you some style inspiration. Until next time, adios!